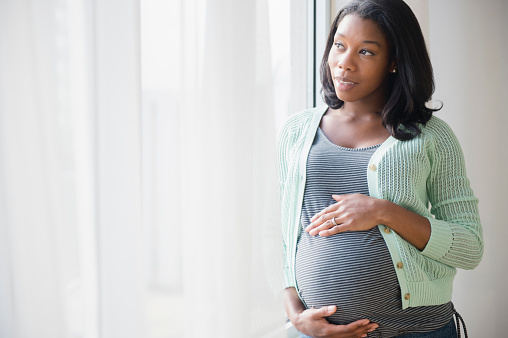 The first thing a lot of naturalistas wonder is how much hair loss will occur during pregnancy. It is a common misconception that pregnancy will cause hair loss. Some women think this is because of the way the hormones in the body react to being pregnant. For example, when you are pregnant, your body naturally produces higher levels of a hormones called progesterone. This hormone is released in abundance by the ovaries as a means of supporting the pregnancy to term. But it actually has some great benefits for your hair! Hair grows in natural phases with a growth cycle called the anagen phase, a catagen phase, and a shedding cycle called the telogen phase. The anagen phase is when hair is in a growing state and new growth is seen at the follicle level. The catagen state is when the hair isn’t growing or shedding. Finally, the telogen phase is when hair is released and subsequently falls out. The reason some people associate pregnancy with hair loss is because while you’re pregnant, the progesterone keeps hair in an anagen phase. When the baby is born and the levels fall again, the hair typically enters the telogen phase. This is a result of not having the excess of progesterone hormones and your body shifts the needs to other areas more important than your hair. Basically, the body has the main job of keeping you healthy and your hormones well-regulated for health reasons first. Anything left over after major needs are met will be transferred to your strands. The good news is most women report healthy, thick hair that keeps growing while they are pregnant, so for nine months, you may end up having the most beautiful curls of your life. However, expect the downfall when the baby comes. The important thing to remember about hair during pregnancy is that you have little to no control over it. Your hair is just doing what your body tells it to do, and this isn’t a bad thing at all. Best of all, this phase of your hair life will not last forever! Many experts report that shedding is common within the first 2-3 months after delivering, and then things will start to even out again 5-6 months from when it started.